So necessary a precursor to what happiness there is to be found in each day, it is hard to trust a man who does not enjoy breakfast. English essayist, historian, poet, sailor, and traveler Hilaire Belloc (1870-1953) made a pilgrimage in the spring and early summer of 1901 from Toul, France to Rome, and he wrote a delightful book about his walk titled, The Path to Rome. As James Schall says, "The Path to Rome is thus not about Rome but about getting there through a Europe that reflects Rome at every step." Dogs eat the first thing they come across, cats take a little milk, and gentlemen are accustomed to get up at nine and eat eggs, bacon, kidneys, ham, cold pheasant, toast, coffee, tea, scones, and honey, after which they will boast that their race is the hardiest in the world and ready to beat every fatigue in the pursuit of Empire. But what rule governs all of this? Why is breakfast different from all other things, so that the Greeks called it the best thing in the world. . .? Being of English stock, this explains my enthrallment with the foods of breakfast. I am naturally attracted to what my ancestors have been doing for thousands of years--eating. But, what is the rule that governs breakfast--that makes it "the best thing in the world?" If Belloc is right that "a little refreshing food and drink can do so much to make a man," then something traceable to the spirit may be occurring at breakfast tables around the world each morning. The spirit, which cannot be separated from the body, may be refreshed anew each day through the simple process of hunger followed by delight in the good. I never thought of how much good bacon, eggs, and whole wheat toast could do for the soul until I read Hilaire Belloc. This is the entrance to what turned out to be one of my favorite public buildings in Rome. It was a wonderful trip and there were certainly more historic, holy, and majestic buildings in Rome, but there was just something special about this place. Located in the thriving city center, here (View this photo) is a view of the inside. The atmosphere (during the day) was conducive to thinking big thoughts, so I did (View this photo). 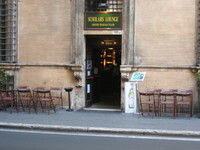 And, it was the only place I found in Rome where televised American football games and scores were readily available. I didn't get any significant reading done yesterday, but, while waiting for a dinner meeting, I managed to get to a coffee shop and bookstore that has been a favorite of mine since about 1990. It is the Upstart Crow , located in Seaport Village (View this photo ) on the San Diego Harbor (View this photo). I have never found the book selection to be very good (mostly popular literature and self help books, with a few others), but the atmosphere, coffee, and pastries are great. Here is a view of the inside (View this photo). Seaport Village is a delightful place to spend an afternoon with the family or sightseeing in the harbor area. There is often free entertainment in the courtyard (View this photo). By the way, the group entertaining at Seaport Village yesterday was excellent--Latin American Folk and South American/Andean music. The gentleman in the center of the group is playing four instruments simultaneously. Check out their website, which has digital downloads. 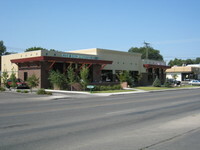 This is another downtown Billings, Montana, coffee shop--Rock Creek Coffee Roasters. The two gentlemen in this picture, standing in front of the shop, do not actually belong to it. They were playing a bongo type drum and two large white plastic pails while passersby looked on. And, they were quite good, in a repetitious, bohemian, postmodern, mind-numbing, sort of way. The shop itself is bright, busy, quite comfortable, and conducive to reading on the inside. Here is a picture of the inside (View this photo), and here is a picture of the actual roaster tucked away in a great corner for reading (View this photo). The coffee shop is in the very center of the downtown area and opened for business after I no longer lived in the area. This trip marked my first visit to this coffee shop. The picture on the right was taken while on a hike yesterday afternoon along a one hundred feet high limestone cliff that runs the length of the City of Billings. It is called the Billings Rimrocks (Rims) and provides wonderful views for seventy-five miles. The picture is a little hazy apparently due to smoke from forest fires that drifted in from many miles away.This picture (View this photo), from the vantage point of a residential subdivision below the Rims, was not taken by me. It shows several possible climbing routes along the Rims, which provide locals with climbing and rappelling opportunities. When we formerly lived in Billings, my youngest son climbed and rappelled these routes. Now this is quite the happening place in Billings, day or night. It is City Brew and, while it is an expanding operation these days, I remember when the original coffee shop opened. There are now several shops in Billings, several others around Montana, and numerous kiosks open around the country. The building featured in the picture on the left is a beautiful coffee shop on one side (View this photo) and an equally beautiful upscale wine shop and wine bar on the other side (View this photo). The owner and employees are locals and very welcoming of casual or serious readers--on both sides of the building. In former days, after working at a desk for hours, I would load up a small backpack and hike to this coffee shop, pull my books out and read for more hours. I would then load up again and hike back home, reflecting on what I had read. It was a hard life. Coffeehouses with quiet music in the background (Starbuck's is too corporate and the music is too loud), preferably Baroque (if it ain't Baroque, don't fix it! ), or Nora Jones singing almost anything. Here are a few AHL favorites: Beartooth Coffee Roasters (I spent many hours in this coffeehouse--when it was known as "Todd's Plantation"--light jazz playing in the background, wood floors, ceiling fans, and windows that open all along the front--classic! ), Square Books (great ambiance, with the coffeehouse on the second floor--the website picture shows the second floor balcony where one can sit and think overlooking the quintessential southern town square--frequented by John Grisham), Cave Creek Coffee Company (in the Sonoran Desert, north suburb of Phoenix--fancies itself the "Austin City Limits" of Arizona--I remember it before it was "discovered"), and the Upstart Crow (a little too "touristy," but a great setting on the San Diego Harbor). When the coffeehouse opens each day and the first three hours of every Saturday morning are the best times for reading and reflection. If the coffeehouse happens to be a roaster, the fresh aroma is all the better. Improves the reflection.